I liked the covers. However, I wish that the pillow inserts were included. 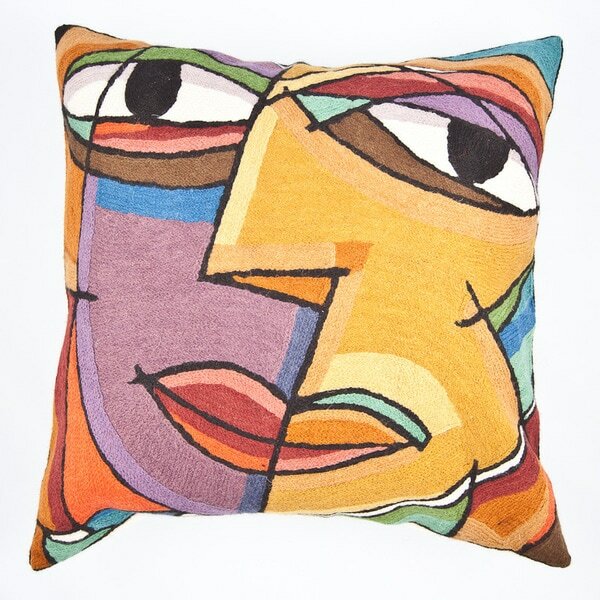 This colorful accent pillow features a wool handembroidered detailing with a unique abstract face design in bright, modern colors. Handcrafted by artisans in India, this beautiful throw pillow is constructed of wool and cotton. Story Behind the Art: How do you make a centuries old craft relevant for today? Manzoor of Cashmere Crafts had the answer. He set up a collaboration with artists from North America to design modern patterns that could then be brought to life by the makers of Cashmere Crafts. Located in Kashmir, India, long a center for fine textiles, the Cashmere Crafts cooperative specializes in the art of chain stitch embroidery, a technique that has been in use since at least the year 1100. It is also painstaking. A pillow can take a team of 3 people 4-5 days to complete. A rug or wall hanging can take up to 18 months. In Kashmir, working with fabric is definitely a family endeavor, employing skills that have been passed down for generations. Manzoor himself is the third generation of his family to work in the textile industry. By working with Cashmere Crafts, these families are able to not only preserve a long history of textile production, but they receive a steady income that enables them to educate their children and provide supplemental income during the cold winter months when agriculture slows down. The handcrafted nature of this product will produce minordifferences in artwork, color/shade, size and overall design.Subtle variations will occur from piece to piece and may not appearexactly as pictured, adding to its unique qualities. Measurementsmay vary slightly. If buying two of the same item, slightdifferences should be expected. Note: Color discrepancies may occurbetween this product and your computer screen. Love this pillow. It's the perfect statement piece for my little "mudroom" by the door to the garage. It's very high quality stitching on the front and a nice quality muslin on the back with invisible zipper. You have to add your own insert. Mustard is one of the new on trend colors and this is an easy way to get a pop. There are several other, equally whimsical, patterns available from this company online here at Overstock. I love the color,design and craftsmanship of this pillow! This is the third of a trio of these pillows I purchased for our spare room/office. Very well made (wool on the print side; linen on reverse) and colorful, working well with the other two choices and complementing the red suede futon. Very happy with this and the other two pillows. The pillow cover is abstract and modern. Provides that pop of accent color and enhances white leather furniture. Use a 20x20 pillow insert for a fully plumped pillow. Fabric appears to be durable and should stand up well. Abstract design is fully embroidered with soft, richly colored yarns. Excellent quality. Looks much more expensive than it is. Stuffed it with a down-like insert slightly larger than the cover size to give a fullness to the image. Excellent quality. Unique design. A real conversation piece. Lovely abstract design pillow cover...Looks beautiful and I am very pleased.. Bold and colorful pillows. Make the colors pop. 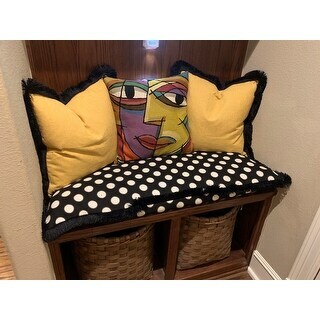 The large graphics along with the texture of the pillow made this pillowcase a perfect addition to our house. Absolutely GORgEous!!! The colors are vibrate and accents our leather sofa perfectly!! Very pleased with the purchase. Was hesitate about the price at first. However, it's definitely worth it! highly recommend!! This is NOT a pillow. It's a cheap-looking mass-produced slip cover. I sent it back the day after it arrived. "what color is the back of the pillow?" Hi valerie808, we were able to verify this information with our support team. The back of the pillow is off white. Thanks for shopping with us.